We provide a theory to explain China’s excessive housing price growth in the most recent decades, despite a high vacancy rate and a high rate of return to capital. We argue that China’s housing prices contain a significant and rapidly growing bubble component. This growing housing bubble generates a substantial degree of welfare losses and resource misallocation in the capital market, which are prolonging economic transition and hindering aggregate economic growth. Housing prices in China experienced rapid and prolonged growth in the most recent decades, rising nearly twice as fast as people's disposable income. 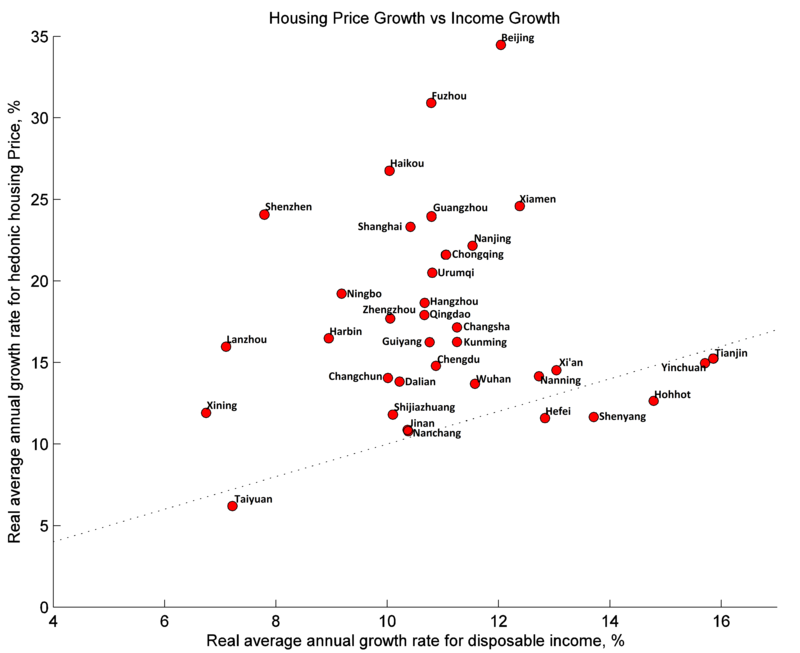 For example, data from thirty-five major Chinese cities show that average real housing prices grew at an annual rate of 17% from 2004–2013, much higher than the 11% growth in average income across these cities and the nation's 10% growth in gross domestic product (GDP) during the same period (see left panel of Figure 1 for national housing price level and right panel for cross-city housing price growth versus income growth; also see Wu, Deng, and Liu, 2014; and Fang, Gu, Xiong, and Zhou, 2015). 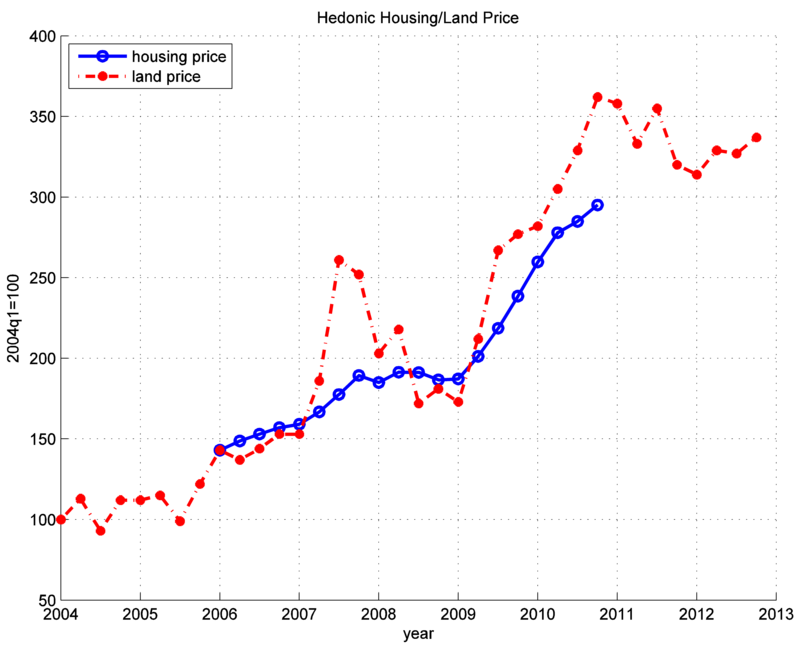 The faster-than-income housing price growth has led to rapidly increasing housing price-to-income ratios in China. Using data for mortgage borrowers from 120 Chinese cities, Fang, Gu, Xiong, and Zhou (2015) find that the price-to-income ratio for middle-income households in first- and second-tier cities reached about 8 in 2011, a level much higher than that during the peak of the U.S. housing bubble (about 3) and similar to that during the peak of the Japanese housing bubble in 1989. This trend of faster-than-income housing price growth continues today despite the fact that GDP growth has slowed significantly, from 10% to below 7% in recent years. For example, in the latest housing boom that started in late 2015, 58 major cities have experienced an increase in housing prices of more than 10%, and among them, 10 cities (e.g. Beijing) experienced more than a 40% increase, nine cities (e.g. Shanghai and Shenzhen) a more than 30% increase, and another nine cities (e.g., Wuhan) a more than 20% increase on a year-over-year basis. Closely associated with the great housing price boom is the high vacancy rate of newly sold homes across Chinese cities, which reached a national average of 22.4% in 2013, according to the China Household Finance Survey (2014). This number is many times higher than the peak vacancy rate recorded during Japan’s housing bubble in the 1980s to 1990s and the U.S. housing bubble between 2000 and 2008. Yet another puzzling phenomenon associated with China’s decades-long housing boom is the high rate of return to capital. During the same period as China’s housing mania, China has also enjoyed a very high rate of return to fixed capital. For example, between 1998 and 2012, China's real rate of return to capital was constantly around 20% or even higher. Several intriguing questions arise: Why have housing prices in China grown for so long and so much faster than people’s incomes? Why is the vacancy rate so high if rising housing prices are driven primarily by a shortage of housing supply? If the vacancy rate is due to speculative investment, why would investors choose to speculate in the housing market when they could earn spectacular returns by investing in the real sector? To answer these questions, it is imperative to identify the economic forces at work behind the great housing boom, study the social economic costs and consequences of the boom, and give policy advice on how to respond to such housing investment mania. We address these questions in a recent paper published in the American Economic Journal: Macroeconomics (Chen and Wen, 2017). Standard economic theory views China’s housing boom as a natural consequence of its rapid income growth and rising urbanization, which generates great demand for housing, thus pushing up housing prices. This theory holds some truth but does not tell the full story. Income-growth-induced demand for housing implies that housing prices can grow only as fast as aggregate income, even under the assumption that land supply is highly inelastic. Therefore, this view is unable to explain the significantly faster-than-income growth of housing prices both at the national level and across major Chinese cities or, more importantly, the latest housing boom (since 2015) despite a significant slowdown in nationwide income growth (the so-called new norm of the Chinese economy). In addition, this theory cannot explain the extremely high vacancy rate across major Chinese cities if housing demand is entirely driven by utilitarian reasons. An alternative theory (based on the classical bubble model of Samuelson and Tirole) is that China’s housing boom reflects an asset bubble because housing prices have far exceeded their fundamental values, as evident in the extremely high vacancy rate across China and price-to-income ratios. This view is based on the argument that in financially underdeveloped economies, houses can serve as an attractive store of value for people’s rapidly growing wealth, even if houses provide no utility (use values) at all. Although this traditional bubble theory can explain the high vacancy rate in China, it nonetheless cannot explain the growth rate of the bubble and must rely on the critical assumption that the rate of return to capital must be so low (or even negative) that holding an intrinsically valueless bubble asset would be rational. But such an assumption is at odds with China’s prolonged high rate of return to capital over the past several decades. 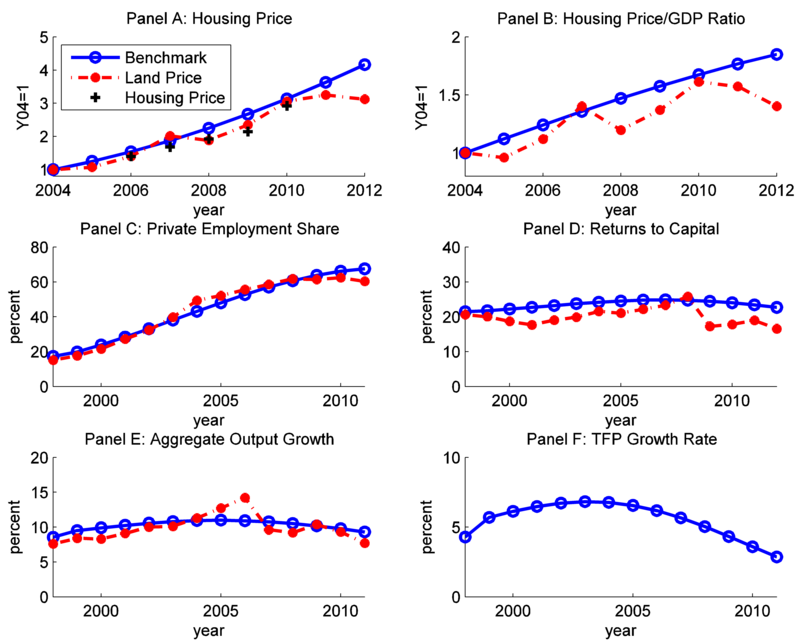 In our view, any theory proposed to explain China’s housing boom must simultaneously confront three main features of China’s economic realities: (i) faster-than-income growth of real housing prices; (ii) an astonishingly high vacancy rate across major Chinese cities, and (iii) a prolonged high rate of return to capital. We think it is the combination of these three features that make China’s housing boom all the more interesting and puzzling. China’s rapid income growth certainly set the stage for the great housing boom, but income growth cannot be the full story. In our recent paper (Chen and Wen, 2017), we argue that China’s housing prices contain an enormously large bubble component and this bubble component can grow faster than people’s disposable income precisely because of China’s high capital returns. In other words, the source of the bubble’s growth lies exactly in China’s high rate of return to capital. Thus, in contrast to conventional bubble theories, we show theoretically that China’s prolonged faster-than-income growing housing bubble requires China’s capital return be sufficiently high (higher than China’s national income growth rate) and persistent over time but decline ultimately only in the long run. In our theory, the sustained high rate of return to capital is a natural consequence of China's unprecedented economic transition. This transition is driven largely by massive reallocation of cheap labor from rural to urban areas, from traditional cartage and small-scale enterprises (such as the village-township enterprises and SOEs) to the modern and growing private sector (as in Song, Storesletten, and Zilibotti, 2011). However, such a high rate of return to capital—driven mainly by resource reallocation—is clearly unsustainable in the very long run (albeit persistent in the short run). Then, according to the Samuelson-Tirole theory, a strong future demand for alternative assets as a store of value will ultimately arise. By backward induction, it is then natural for rational investors to speculate in the housing market today to preempt the strong asset demand in the remote future, even if every generation of investors is short-lived. This rational forward-looking speculation leads to long-lasting bubbles in the housing market despite high capital returns at the present time. Interestingly, the self-fulfilling bubbles’ growth rate is precisely dictated by the rate of return to capital under free arbitrage. Therefore, it is not surprising to see extremely high vacancy rates across major Chinese cities in their most expensive districts and property markets. Obviously, the rise of a housing bubble depends also on other economic conditions. For example, China’s capital controls and severely underdeveloped financial markets have severely limited the availability of alternative stores of value for people's rapidly growing wealth. Thus, housing investment (instead of the ill-managed Chinese stock market) becomes the best alternative for storing wealth. Why does the housing bubble grow faster than income? Because we argue that the growing housing bubble is a self-fulfilling phenomenon and its growth rate must be equal or above the rate of return to capital investment, as required by the no-arbitrage condition, our model has strong predictions about the behaviors of the marginal investors in China’s housing markets. In particular, the richer the housing investors are and the better access to higher capital returns they have, the higher the rate of housing price growth in their living areas relative to local average income growth. This prediction of our theory is confirmed by the data. Using panel regression at the city-level, we show that across major Chinese cities, the private rate of return to capital is a strong predictor of the city's excess housing price growth relative to income growth, and capital returns of private firms have larger and more significant predictive power on a city’s excess housing returns than the capital returns facing that city’s SOEs. Our model also implies that among different groups of households, richer households tend to own more vacant homes, which is also consistent with the data. For example, according to the China Household Finance Survey (2014), 35.1% of entrepreneurial households (those who own businesses) own vacant houses, and the proportion of households owning vacant houses increases with household income. In the top decile income group, for example, 39.7 % of households own vacant houses, which is about 22 percentage points higher than households in the lowest income quartile. Our theory also predicts that a fast-growing housing bubble can crowd out real economic activities such as capital investment. This prediction is also supported by empirical evidence at both the aggregate and the firm level. Firm-level data show that a substantial fraction of non-real estate firms (including very productive manufacturing firms) in China engage in real estate investment unrelated to their original business. The growth of real estate investment is significantly and positively correlated with housing price growth, while non-real estate investment is significantly negatively correlated with housing price growth. More importantly, higher growth in housing prices in the immediate past is a strong predictor of the decrease in current and future investment growth in the non-real-estate sector. Such a crowding-out effect is also consistent with other empirical studies. For example, using land transaction data and matching them with Chinese listed companies, Chen, Liu, Xiong, and Zhou (2016) find that higher real estate prices induce more investment in commercial land that is unrelated to firms’ core businesses and less investment in non-real estate activities. We also calibrate our model to match China's major macroeconomic features, such as GDP growth and labor market dynamics, and show that it can quantitatively replicate China's aggregate housing price dynamics between 2004 and 2013 fairly well and still be consistent with many salient features of the Chinese economy (see Figure 2 below). Our analysis suggests that housing bubbles generate a substantial degree of resource misallocation and welfare losses, prolonging economic transition and slowing down aggregate economic growth. Our theory also sheds light on housing bubbles that occurred in other emerging economies, such as Korea and Taiwan in the 1980s and 1990s. These two economies experienced similar development featuring fast economic growth and high capital returns sustained by inter-sectoral labor reallocation from agriculture and cartage industry to manufacturing and the urban sector. In South Korea, land/housing prices almost tripled during 1985–1991 against the background of 12.5% real GDP growth per year in that period. Similarly, Taiwan witnessed a sharp increase in land prices in the second half of the 1980s, with average housing prices in the Taipei area more than quadrupling from late 1986 to early 1990. Similar to China, these economies also featured underdeveloped financial markets and the lack of efficient store of value for their growing wealth. Therefore, with diminishing marginal product of capital and anticipated low capital returns in the future, even the currently productive agents would seek alternative stores of value ahead of time for their rapidly growing wealth from manufacturing. Given the capital control policies widely adopted by governments of developing countries to prevent capital outflows, land or real estate become the natural choices of speculative investment, resulting in soaring housing prices that far exceed the growth rate of average disposable income. Our theory offers many policy implications and suggestions. For example, our model suggests that implementing policies to poke the bubble is not necessarily desirable and welfare improving, despite the crowding-out effect of the growing housing bubble on capital investment, because for many households, the housing bubble has been the best store of value available to them. Therefore, the best policy is not to poke the bubble but to contain the bubble and reduce its growth rate to a level below the rate of aggregate income growth. Several policy tools can be considered to achieve this goal. First, build a transparent housing transaction and property registration system. This would ensure that all market transactions of housing purchases are fully registered and recorded. Involving government-authorized independent third parties (such as title companies) in any real estate transactions would not only eliminate illegal and unwanted transactions in the market but would also set up an institution to implement other housing policies (as discussed below). Second, utilize the above institution for housing transactions to impose capital controls for cross-region capital flows within China. If money could flow freely from all corners of the world to Beijing to purchase real estate properties without restrictions or registrations, there would be no way to prevent skyrocketing housing prices in Beijing. Therefore, there must be restrictions imposed on people who do not live or work in particular cities from purchasing houses there. For example, unless a person works in a city for more than a certain number of days in a year, that person would not be allowed to buy houses in that city. Third, levy real estate property taxes. However, in order for local government to have enough incentives to implement capital controls and levy real estate property taxes, the central government should be able to confiscate (extract) all revenues from land sales by any local government and then redistribute them according to local needs. Forth, facilitate the development of rental markets. Local governments should design policies that encourage homeowners (especially those who own vacant houses) to put their properties into the rental market. This would require an institutional environment that reduces transaction costs between renters and homeowners and that protects the homeowners’ interest and ensures proper and efficient collections of rental income. Going forward, in order to contain speculative housing demand and to squeeze funds out of the housing market back to real sectors of the economy, China must develop better and well-regulated financial markets and financial instruments to serve as alternative stores of value and insurance devices for people’s rapidly growing wealth and to meet their basic needs for saving and self-insurance. Chen, Kaiji and Yi Wen (2017), “The Great Housing Boom of China,” American Economic Journal: Macroeconomics, 9 (2), 73-114. Chen, Ting, Xiaolei, Liu, Wei Xiong, and Li’an Zhou, “The Speculative Channel and Crowding Out Channel: Real Estate Shocks and Corporate Investment in China,” unpublished manuscript. China Household Finance Survey (2014), “Urban Housing Vacancy Rate and the Trend of Housing Market Development,” unpublished manuscript. Fang, Hanming, Quanlin Gu, Wei Xiong, and Li-An Zhou (2015), “Demystifying the Chinese Housing Boom,” NBER Macroeconomic Annual, 2015, 105-166. Edited by Martin Eichenbaum and Jonathan Parker, Chicago, IL: University of Chicago Press. Song, Zheng, Kjetil Storesletten, and Fabrizio Zilibotti (2011), “Growing Like China,” American Economic Review, 101, 196-233. Wu, Jing, Yongheng Deng, and Hongyu Liu (2014), “House Price Index Construction in the Nascent Housing Market: The Case of China,” Journal of Real Estate Finance and Economics, 48 (3), 522-545. Controls on capital outflows is an important reason why house and land prices are overvalued.